After the big bang in box office made by Chennai Express, It’s the time to Krrish. Much awaited movie of the year Krrish 3 got released today over 4000 screens in India, has already registered around 40-50 percent advance booking occupancy in multiplexes of the metropolitan cities like Delhi and Mumbai. The film will have more than 180 shows daily in circuits like Bangalore, Pune, Chennai, Kolkata, Hyderabad and others places. The tickets at most of the places are either sold out or are filling fast. The pre-booking occupancy in single screens is also picking up fast. Single screen in places like UP, Bihar, CP, CI and Punjab have also shown record pre-booking occupancy. Superheroes have always captured the fancy of millions across the globe for ages and with the introduction of Krrish, India found its own bonafide superhero. Thanks to the Roshans, Bollywood has its first superhero franchise, that has taken one step further with the big release of Krrish 3 today, amidst the festive season of Diwali. A third in the franchise that began with 2003 movie Koi... Mil Gaya, Krrish 3 will take forward the story of the superhero Krrish, played by Hrithik Roshan. 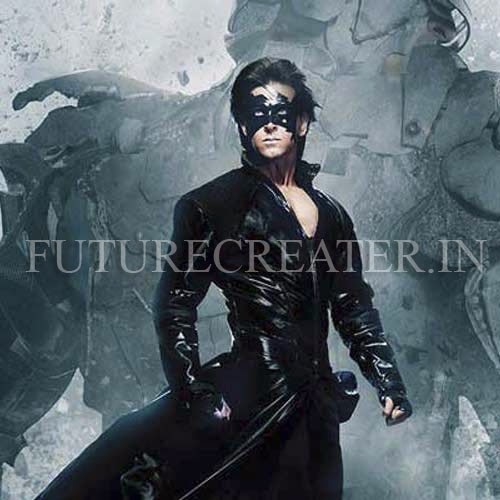 Like it's prequels,Krrish 3 once again takes us into the world of masked fantasy where the stakes are incredibly high and this time our superhero Krrish faces the challenge of saving the world from the clutches of the villain Kaal (Vivek Oberoi). After defeating the villainous Dr. Siddhant Arya, and bringing his father Rohit back from the dead, Krrish continued fighting against evil and saving innocent lives. Now Krishna is living a happily married life with Priya, while Rohit is using his scientific brilliance to benefit society. And Krrish is everyone's favorite superhero saviour. He lives with his wife Priya (Priyanka Chopra) and father Rohit in Mumbai.Unknown to them, a dark force is growing in another part of the world. Kaal, an evil genius, is selfishly misusing his powers to spread fear, death and destruction. And he is being assisted by an army of very dangerous beings, which he has created himself. Hell breaks loose when a virus spreads in the city.Rohit finds a cure for it but manages to earn the wrath of Kaal (Vivek Oberoi) who releases his army of mutants or Manwars (Manav + jaanwars) on his family. Krrish has to save his family, his city, it's people and overpower this super villain. Let me assure you right at the onset that Rakesh Roshan has packed din enough in the film to make a Krrish fan get his/her money's worth. A superhero franchise escapade that delivers fully on it's promise and raises the bar for future desi superhero films. It's movie escapism at it's best. Krrish 3 is an entertaining mix of spectacle and human-scale drama. Roshan combines his imagination and flair to deliver a film that is sure to capture everyone's imagination. It has something for everybody. For a superhero film fan there are fantasy characters, a super villain, full scale heroism, plot twists and superb action. For a Bollywood fan, there is enough emotion, drama, love story and songs. For the bachchaparty there are plenty of exciting and exhilarating moments. The film is fast-paced, the effects are smashing, and what works is that Krrish is engaging and endearing even when he is is out of costume. Krrish may be a superhero but it is his human side that is so appealing. Hrithik Roshan is oh-so-watchable in every frame. He owns both the roles with such ease. Kangana Ranaut is delightful as an alien making the weird hair and clothes work for her. She even manages to make you feel her pain. Quite an accomplishment that! Every action adventure needs a memorable villain. Vivek Oberoi as Kaal ensures you won't ever forget his act. Priyanka is saddled with a role that doesn't do her justice. She deserved a meatier role. It's a gallery of product placements, which ruins the movie experience repeatedly.The music could not have been worse. The film — aimed more at kids, than adults gets a little complicated at times, making you wonder if the young ones will be able to grasp it. It is highly derivative. It borrows heavily from almost every superhero film you have seen. If I had to list them, it would take up the entire review's space. This is the kind of film one can unabashedly enjoy for what it is. Go on, indulge the superhero fan in you.